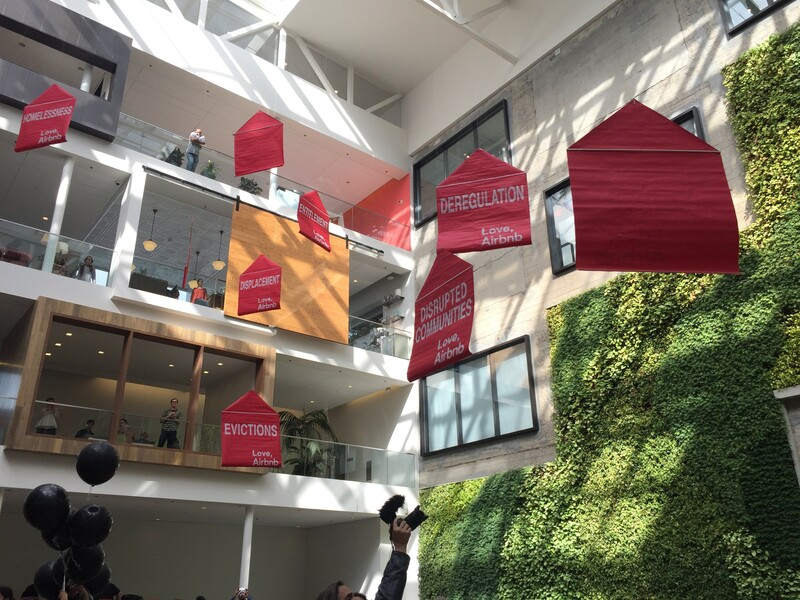 Dozens of housing and homeless activists stormed the Airbnb headquarters at 888 Brannan Street around noon today. A day before San Francisco voters will decide whether to regulate "home-sharing" more strictly, the activists sought to show the short-term rental company what "sharing" is all about. "There are over 3,000 homeless children in San Francisco," said activist Maria Zamudio, an organizer with Causa Justa. "Airbnb's practice of turning homes into hotels is exacerbating those conditions." The occupying activists were accompanied by the Brass Liberation Orchestra. Organizers set up tables and laid out pizza, in order to provide a free meal and services to the homeless. “Eviction is the driving force of homelessness," said Jennifer Friedenbach of the Coalition on Homelessness. Airbnb has been in the news much of late. The company, valued at $25 billion during its latest summer fundraising round, could see its business model strictly regulated if voters approve Prop. F tomorrow. Proponents of Prop. F accuse Airbnb of exacerbating San Francisco's housing crisis by incentivizing the conversion of housing units into tourist hotel rooms. Airbnb has spent over $8.3 million on a campaign to defeat the initiative. Airbnb's offices on Brannan Street are just a few blocks from the highway underpass where dozens of homeless people sleep in tents each night, but the contrast couldn't be greater. According to San Francisco Magazine, the office includes rooms decorated as, "a Balinese single-family home decked with potted palms, intricate wall tapestries, and a woven grass ceiling; a Milanese one-bedroom that features lavender toile wallpaper, a flat-screen TV, and a dining table seating eight; and a quaint Parisian flat filled with Eames furniture and splashy shadow-box art." Airbnb software developers meet in a conference room "modeled after the War Room in Dr. Strangelove." The No on Prop. F campaign asserts that Airbnb is helping keep San Franciscans in their homes by allowing them to earn extra income through renting out their space bedrooms. Update: The protesters left Airbnb at 1:30, after about 90 minutes inside the atrium. A spokesperson for Airbnb was present throughout the protest but declined to comment. Security and San Francisco police officers observed the protest, but did not interfere or make any arrests.